Buckup: Deathtrap restores the sheilds of one ally. Upshot Robot: While Deathtrap is active, if you or Deathtrap kill an enemy it increases Deathtrap’s Duration and grants both of you a stackable Melee Damage bonus. Bonuses are lost when Deathtrap goes away. Explosive Clap: Deathtrap causes an explosion in front of him, dealing Explosive Damage to all nearby enemies. Make it Sparkle: Shooting Deathtrap with an elemental weapon charges him with that element, causing his melee attacks to deal additional damage of that element. The little big trouble tree looks like fun. I usually I don't go for the electric weapons because their damage takes a dive once your target's shield is down. But I like the idea of your electric weapons also setting stuff on FIRE! Mwa ha ha ha! Yep, that extra ability seems fun. 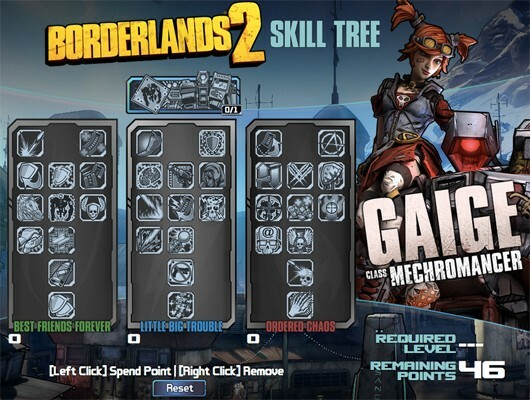 The Mecromancers skill tree is pretty creative, too bad she didn't ship with the normal game. I need to get Maya to max level fast so I can be done with her when Gaige comes out. This is quickly becoming the most interesting class. Multiplayer should be fun on day 1. Hundreds of 4-mech parties. While we're on the topic of classes, does anyone else have zero interest in the commando? Axton is pretty good. I use him when I play with my friends. The turret is pretty good and this time around its a bit better. Looks like the Mecromancer is made to be a sort of support class though now, which is pretty cool. I love playing as axton. His turret is much better than the one in the first borderlands as Jon said. Currently he is my favorite character, that is, until Gaige comes out. I'm really looking forward to trying out her skills. Hey yall, looks like Gaige will drop later today, or a full day early. Going through the skill names I'm amazed at the My Little Pony references. 20% Cooler, Evil Enchantress, The Stare, Discord, and Potent as a Pony (sort of) all reference MLP. Kinda cool. But awesome that she's dropping today! Can't wait. /me not obsessed with MLP. I liked it when I was a young lad i'll admit. Happily not a Brony. That said, I have no aversion to Bronies. I play Axton as my solo character. The Turret is fun and really helpful while playing solo. Plus, when 5 points are put into it, one of Axton's first tier abilities gives you a +20% gun damage. That's an awesome tier 1 ability! And WHAT!? Mecromancer drops today!? That's awesome! I can't believe they released it early! I am so excited to try her out. I won't be able to till tomorrow though, but still, I'm just extremely happy they released her early. OK, can I just say... The mechromancer is awesome. That is all. Yeah she really is. Played her tonight in 3 person game to level 9 and she was awesome. Deathtrap is real fun! He is like a much better version of the turret with melee and ranged attacks. Plus he stays on the battle field pretty long compared to other abilities! Just tried Maya with 3 people and lockdown is DOPE FLY! The abilities I had were if you kill something in lockdown you get health regen orbs. Really useful in co-op. I also tinkered with the shoot to heal ability, that was fun but at a low level kind of a bullet waste. Didn't think the new Siren would be good at all, I really like her quite a bit now.